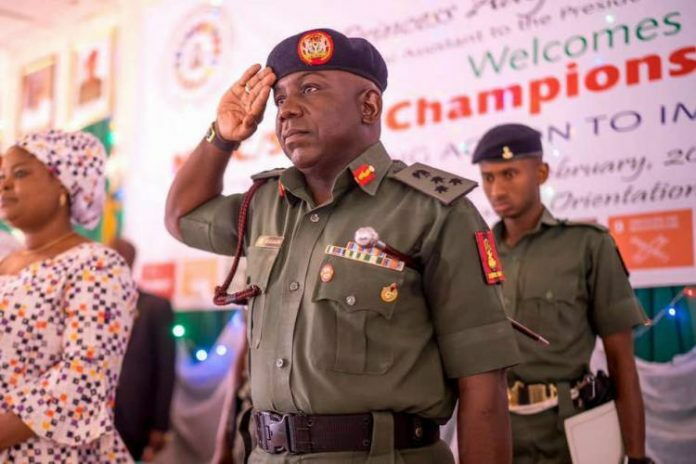 The Director-General of the National Youth Service Corps, Brigadier General Suleiman Zakare Kazaure, has reminded corps members that the time of national service is a period of sacrifice. Brig Gen Kazaure asserted this during his interactive session with corps members when he addressed them at the Permanent Orientation Camp, Ogbakuta, Iseyin, Oyo State. The NYSC boss charged the corps members to see their participation in the national service as a preparatory assignment to take up the leadership positions in not too far away distance. “My patriotic Nigerians, you are our hope and future leaders that are being mentally and psychologically prepared to take up the position of trust and authority in this country. General Kazaure who is the first Director-General to possess doctorate degree said that it was worrisome that educated, able, strong and energetic youths are roaming the streets after their mandatory one year service to the nation. “To stem this tide, the NYSC through the Skill Acquisition and Entrepreneurship Development (SAED) programme in conjunction with Financial Institutions and empowerment agencies has been trying to give new lease of life to corps members. “Ensure you take advantage of the one in a lifetime opportunity to becoming great entrepreneurs and captains of industries which will translate to improved Gross Domestic Product and a better life for all Nigerians”. The Director-General who is impressed by the tone of discipline and cleanliness of the entire camp environment commended the State Coordinator and her team for a good job. Welcoming the Director-General, the State Coordinator, Mrs Ifeoma Anidobi reported that the camp registered 2304 corps members for the three states in which Kwara had 640, Ogun got 688 and Oyo recorded 976 respectively. Mrs Anidobi said the camp requires urgent intervention in the area of Multipurpose Hall to accommodate lectures and other indoor activities. Another important area is the construction of Parade Ground as the present Sports Ground which serves dual purposes affects time management. The high point of the visit was the inauguration of the Mini OBS Studio by the Director-General completed by Mrs Ifeoma Anidobi. The visit had in attendance Director, Special Duties, Mr Hilary Nasamu; Director, Press and Public Relations Unit, Mrs Adenike Adeyemi; the Ogun State Coordinator, Mr John Okpo and his Kwara State counterpart, Mr Remigius Amaefule.